The winter morning had begun dull and drizzly, but by the time we set off on our expedition to Brisbane's northside for brunch by the seaside, glorious sunshine and a zephyr breeze had swept away the clouds. We hoped it was a sign of things to come and that hope was happily realised at Mon Komo Hotel and its Restaurant Caribbee. Our brunch was a winning combination of delicious, artfully presented food; friendly, efficient service; and a relaxing beachside ambience. Who could ask for more? With roadworks peppering our route from Brisbane's deep south, we left early to make certain we were on time for our reservation. We arrived early, which was a bonus, because it left us with time for a quick exploration of this picturesque (but wholly unknown to me) corner of Brisbane. 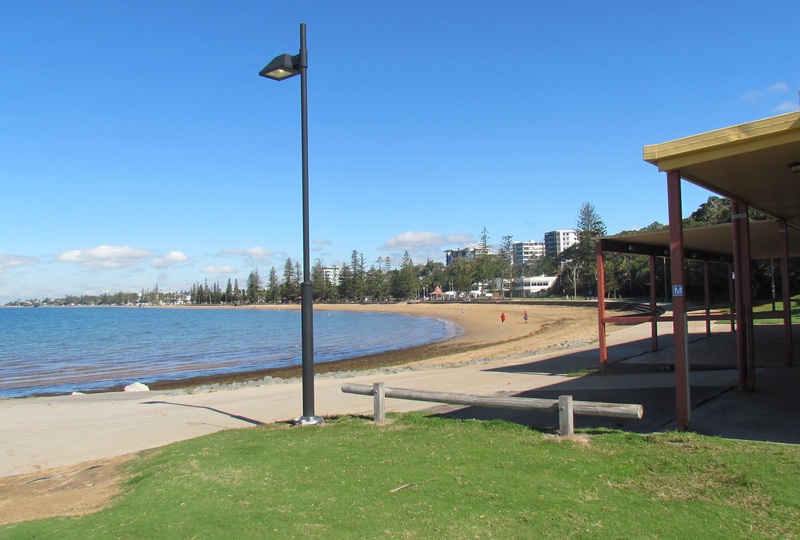 In my mind, Redcliffe had always been just a signposted turn-off from the M1 on the way to the Sunshine Coast. How wrong was I? 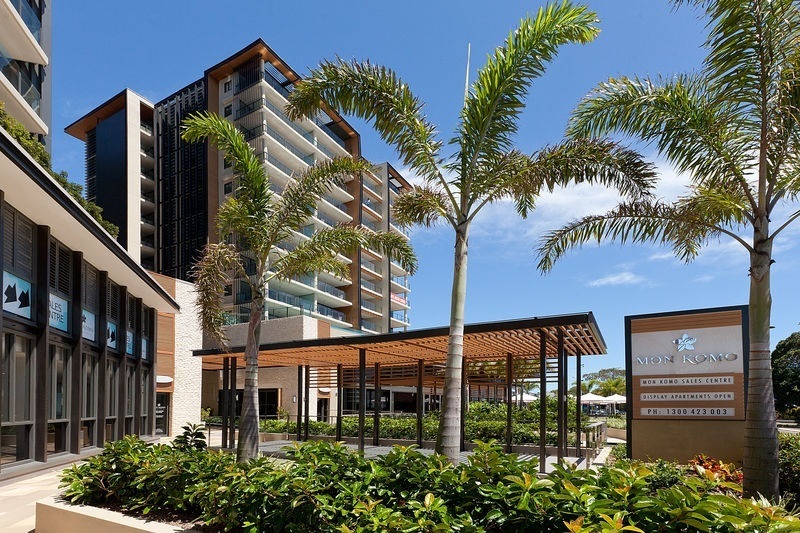 Redcliffe seems a lovely mix of quaint seaside town with modern adornments, of which Mon Komo Hotel is a very pleasant example. It sits in a picture-perfect location, overlooking Settlement Cove Park, just north of the popular Suttons Beach. The building itself takes advantage of the location, presenting a modern, welcoming exterior. I'm always disappointed when a place tries too hard to evoke a beachy ambience - you know the places dominated by blues and yellows and images of sun, sand and sea everywhere you look. I much prefer a place that lets its enviable coastal position speak for itself. Mon Komo does just that. Its interior decor uses a variety of timber tones from the warmth of seating and tables to the bleached-wood effect of the facade that stretches across the bar and kitchen servery. The double height lobby and soaring greenery lead your eye to the building's nod to its marine environment; ropes strung across the ceiling that creates a subtly nautical effect. 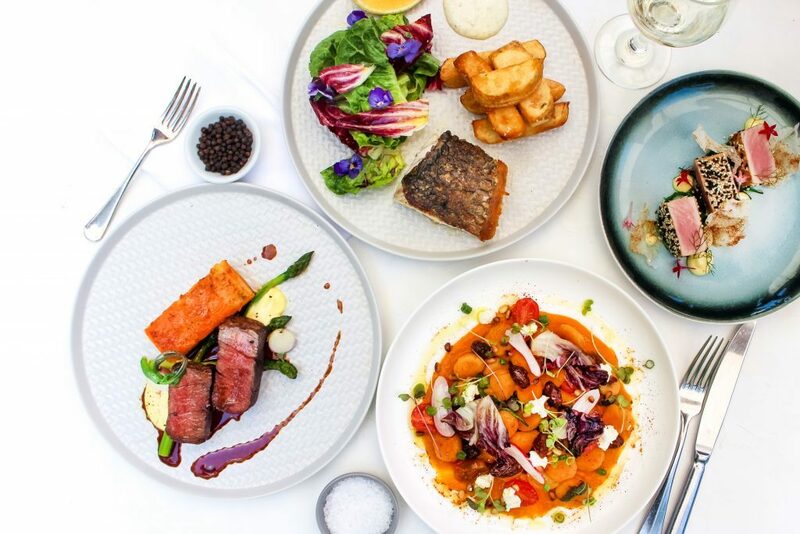 Huge folding glass doors open to the outside which includes an open bar area fronting the street with views across to Moreton Island, and a covered and screened dining area with green chairs and timber tables adorned with deep red drinking glasses. This is where we chose to sit on such a spectacular day, with the slatted ceiling casting softly-striped shadows over our meals. 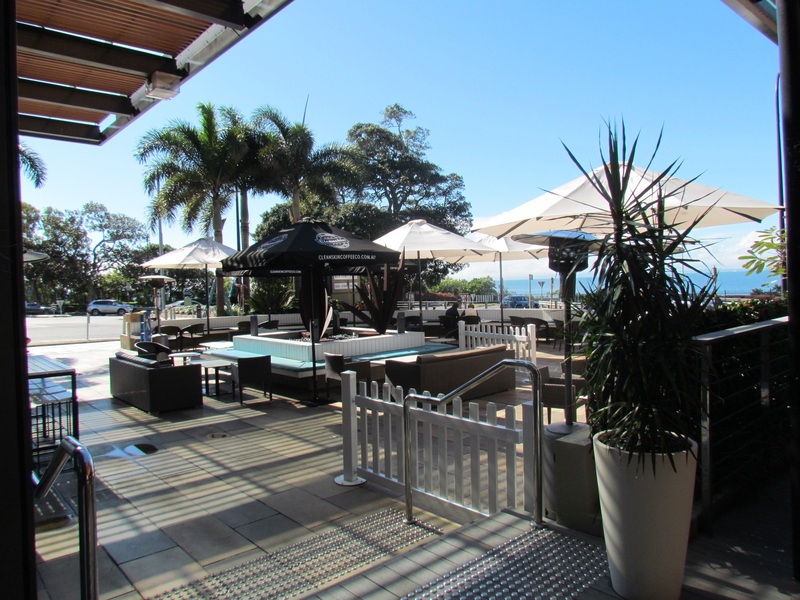 Outdoor area overlooking Moreton Bay. We were greeted warmly by Fran, who settled us at our chosen table and took our tea and coffee orders. 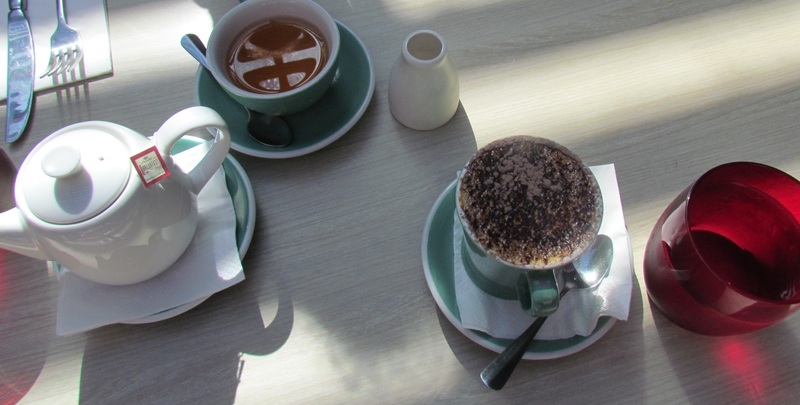 These arrived promptly: a rich cappuccino for me and organic English Breakfast for my husband. The breakfast menu looked very enticing, and in a close-run tussle the salmon rosti ($21) just edged out the chipotle baked beans with crumbed egg ($17) for me. I also ordered a side of mixed sauteed mushrooms. My husband chose the eggs benedict with champagne ham ($17) with a side order of pork sausages. My salmon rosti (zucchini potato rosti, lime hollandaise, poached egg and fennel) was an explosion of pink, from the crimson of the cabbage and edible petals to the delicate pink salmon and back to the deep magenta of the freeze-dried beetroot dust that was artfully sprinkled over the plate. This was balanced by the scattering of green leaves and the smeared arc of pale hollandaise. I dug into the plump egg and the yolk cascaded yellow over it all. A symphony of pinks, greens and yellows, it was the prettiest thing I've seen on a plate. A symphony of pinks, greens and yellows. And this was certainly not a case of style over substance. The rosti underneath it all was crunchy and flavoursome with flaky salmon and salad leaves contributing soft and fresh elements to the mix. The egg was perfectly cooked (viscous rather than runny) and the silky lime hollandaise added a tangy punch. The mixed mushrooms were salty and tasty. 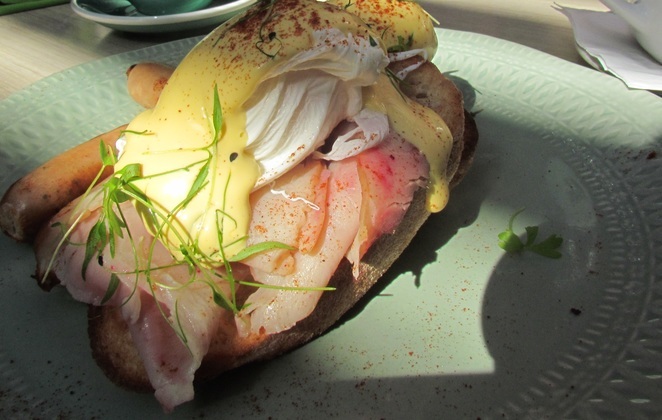 Although not quite as theatrical as my dish, my husband's eggs benedict looked inviting and hearty. His eggs were also perfectly cooked and the sourdough toast was golden and crunchy. 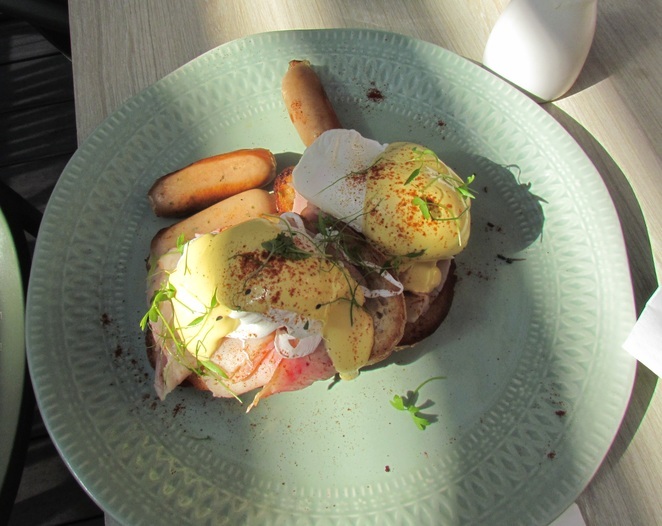 Smoky ham flavours melded well with the buttery house-made hollandaise and his pork sausages were excellent. I'm a lover of original tableware and both our meals were presented on large, textured plates that added to the overall effect. Our breakfast was a memorable experience. We had first-rate, polite and friendly service from Fran throughout. 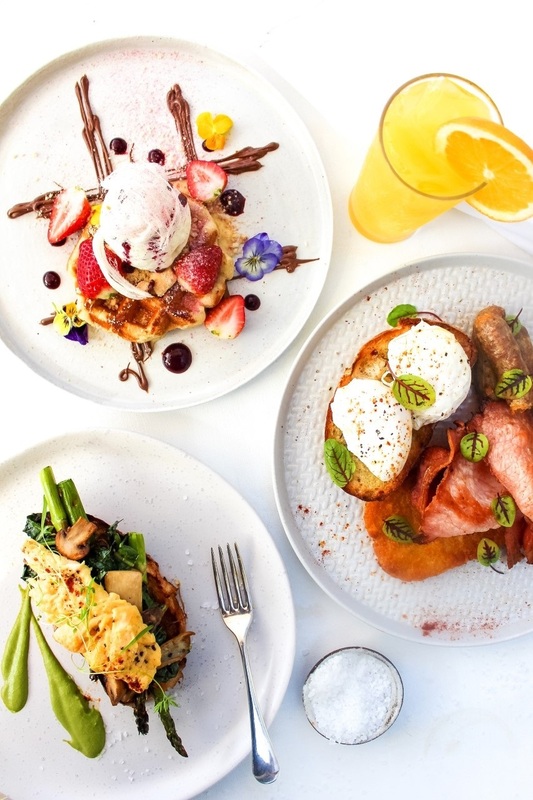 Chef Tim Stanton has created a colourful breakfast menu that includes new takes on old favourites and interesting offerings such as strawberries and cream waffles (strawberry three ways, vanilla fairy floss and vanilla bean ice cream - $16) - something to come back for on another occasion. The lunch and dinner menu also contains intriguing items like 'pan-seared scallops with celeriac, vanilla, green apple and textured potato' ($18); 'crispy skin chicken breast with corn puree, charred sweet corn, tomato, lime salsa and popcorn ($24); and... drum roll, please... 'deconstructed citrus meringue tart with pastry soil, citrus sorbet, lemon curd and freeze-dried blood orange' ($10). Image from Mon Komo website. My husband and I are already looking into the prospect of a weekend away to Redcliffe. Above Mon Komo Hotel you will find Oaks Mon Komo with hotel rooms starting at $152 per night and two-bedroom ocean view apartments with balconies from $287 a night. This way we can have dinner AND breakfast at Caribbee, along with ocean views, salt-tang air and long walks along the beach. The siren song of that citrus meringue tart is calling me. Why? Artfully presented and delicious food; friendly, efficient service; and a relaxing beachside ambience. You're right, they made the Salmon Rosti look so beautiful. Well deserved gold Geraldine ... I love the Redcliffe area but this Mon Komo Hotel looks like a newer luxury addition. The meals look most tempting.